Atkinson Drive & Ala Moana Blvd. Live music will be played nightly on The Signature's white grand piano creating the perfect soundtrack for your intimate dining experience. Ocean-Side Room - Up to 45 people can take advantage of the floor to ceiling windows providing beautiful ocean and beach views as well as a panoramic sunset view. A benefit of booking your special event on a Friday night in this room is the fireworks display. You will have front row seats to its exquisite location. Mountain-Side Room - Up to 25 people can enjoy dinner in this room while they peer out of the floor to ceiling windows onto the beautiful tropical mountains and extensive city views. Wine Cellar - Bring 8-10 of your closest friends and family to enjoy an intimate dinner in this charming private room displaying The Signature wine cellar as well as the beautiful tropical mountains. 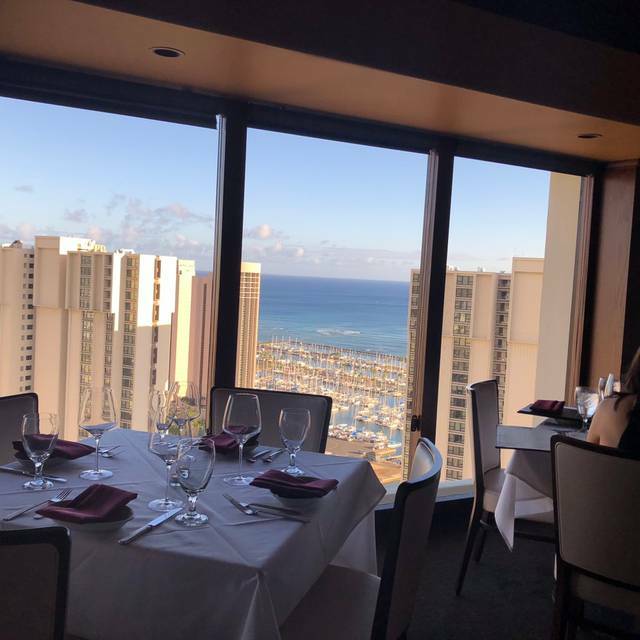 Located on the 36th floor of the Ala Moana Hotel, The Signature Prime Steak & Seafood restaurant is the new home to a space known historically for memorable evenings with Oahu's most epic views. 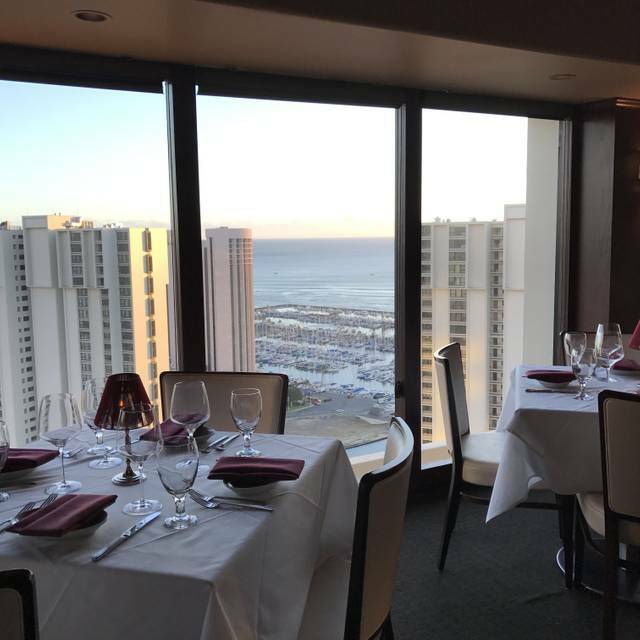 Upon entering from the elevator on Ala Moana Hotel's top floor, each new diner will be enthralled by crystal chandeliers and live music played on The Signature's white grand piano. 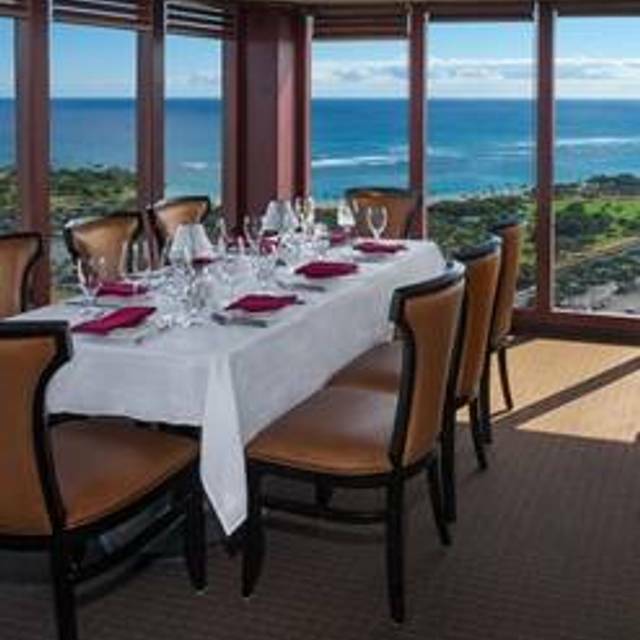 When it comes to choosing a table, the opportunities are endless: The intimate bar, piano lounge, vintage-style ocean view booths, an exclusive experience in our wine cellar, or any of our luxurious mountain room or ocean room tables. From first sip to last bite, prepare to be wowed by our Signature combination of customer service and hand-selected quality menu options. Enjoy selecting from our thorough wine list, which has been crafted to pair perfectly with all our chef's creations. Please be our guest. Take the journey to share an evening with us that you will remember forever. 3rd Year Anniversary Date successful!!! Amazing Service, Food, and music. Every worker greets, ask how we are doing and know the occasion and congratulated us for making three years. Will be coming back! 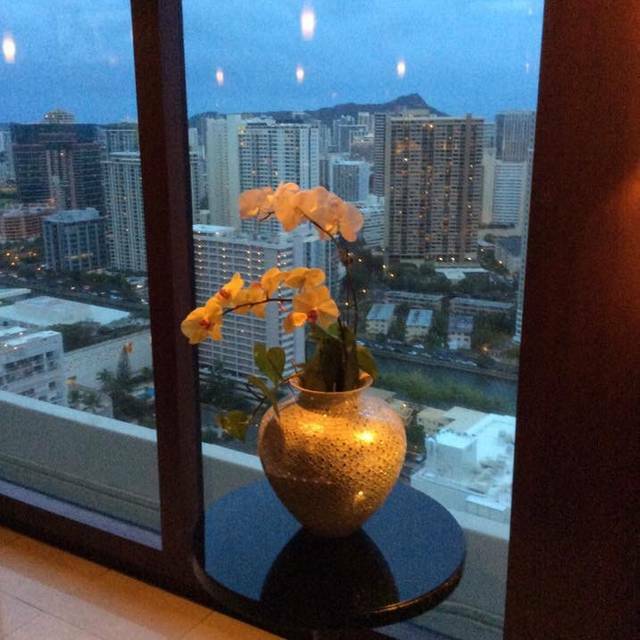 We were on our honeymoon and we were staying in the Ala Moana Hotel and heard great things about this restaurant. We weren't disappointed, the food and service was unbelievable. We really enjoyed our meal, thank you. 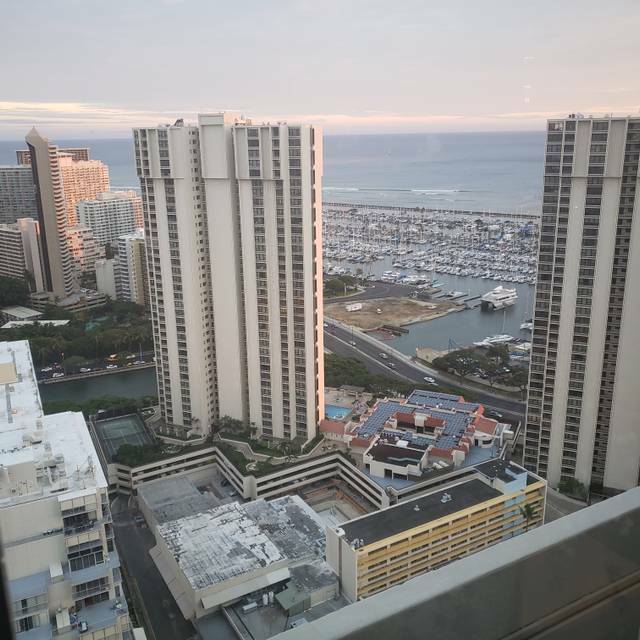 Great Service, came with two out of town guest that travel the world and wanted a 5 star Honolulu experience. They where raving into the night about the service, food, the view from the Kapiolani Blvd side of the restaurant. The Butter fish and the Tomahawk steak where cooked perfectly, the pianist was outstanding and played a medley of songs that allowed us to play "Guess that Tune" while we dined. One of my favorite places to bring friends and visitors, well done to the the entire team! Cannot beat the views, need more vegetable choices. Steak was good and well cooked. Service was ok, could have been better. Wonderful view of the setting sun. Lobster bisque was great. We ordered the Tomahawk steak, Alaskan Crab legs, corn, a salad and two beers for $250. The crab legs were incredibly over salted—to the point of being inedible. This was our 3rd or 4th time coming. We’ve never ordered the crab before this trip. Not very happy with this visit. Management was very friendly!Service was great!Crab legs were delicious!! The service at Signature Prime is always top notch. The food is always excellent, tasty and delicious. This is our 3rd time here and we love it, our favourite steak restaurant. Thank you for always making every occasion that we’ve celebrated at Signature Prime memorable (and of course, delicious). We were there for a surprise birthday dinner. The hostess did a great job ensuring everything was ready to go for the guests to get settled before the guest of honor arrived. Our server, Nikolas, was amazing. He was so polite, friendly, engaging, and attentive. The food was also incredible. The entire experience was perfect. Mahalo! I went to the restaurant around 6pm on Saturday and bar area was very crowded and not so bad on the dining area. The view was very nice and overall ambience was fine. I thought the background music was on a louder side so I had to talk louder to have a conversation. Food was very nice and tasty. I ordered 16oz rib eye and the temperature was perfect. The steak was a little bit salty, but eating with complimentary mashed potato made it perfect. I recommend the garlic fries here! The service was excellent, our waiter made sure we were comfortable and he was very courteous and attentive. The food was served quickly. The majority of us ordered the ribeye and we all agreed it was cooked and seasoned perfectly. Everyone in the party had a wonderful time at the restaurant. 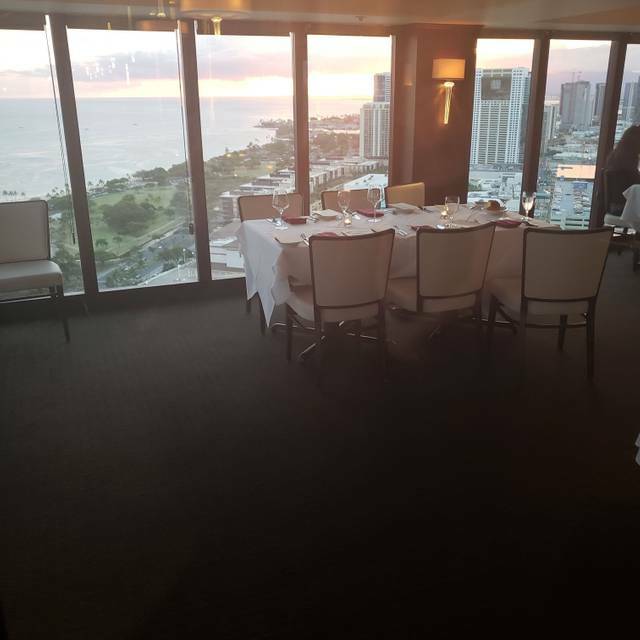 Gorgeous views and amazing food and service! This was our third time dining at your restaurant and the service and food did not disappoint. 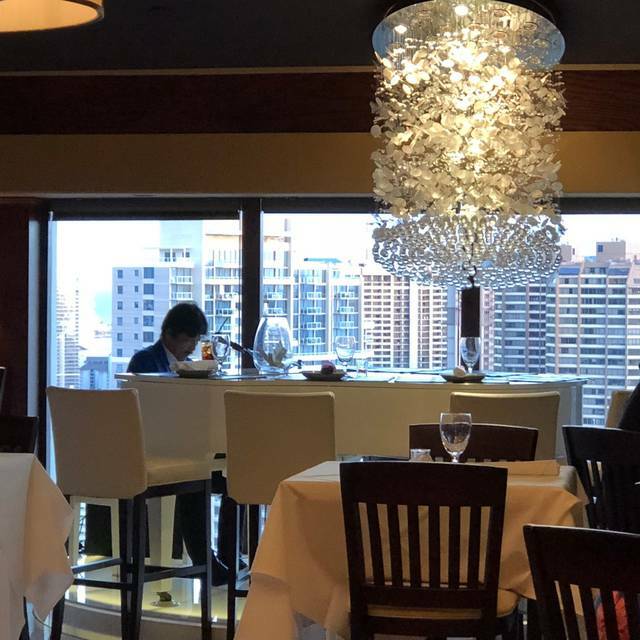 I requested a table with a great view and was given one. The only thing I would recommend is having better dinner music played over the speaker. Luckily it didn’t come on until we were on dessert, but the music was too loud and not appropriate for your fine restaurant. My family and I agreed it brought the experience down and was something that you would hear at a fast food restaurant. Amazing food & service! My husband's birthday celebration at this restaurant turned out so wonderful. We will definitely be back! Husband, daughter and I had the best meal in a long, long time! Service is awesome. I would come back for a family dinner or with a group of friends. Everything was outstanding. Our server , Kylie, was an absolute professional and very nice to our party. We'll definitely go back and ask for her. Great steakhouse. Service was great even though our appetizer came out late (comped). 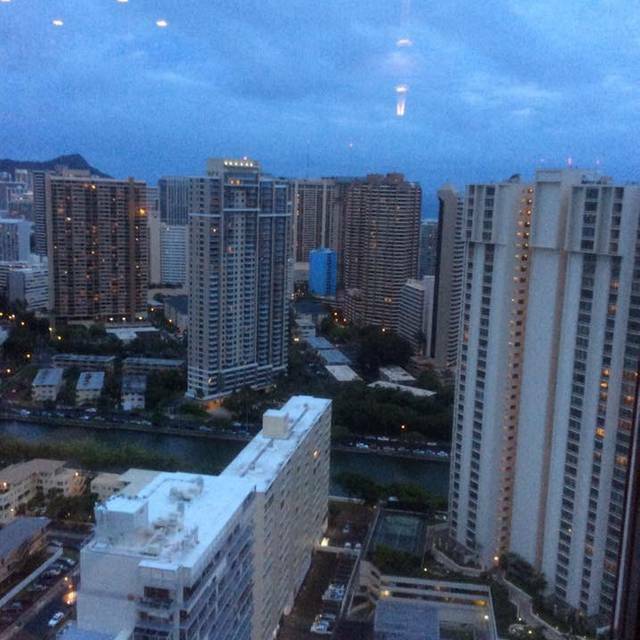 View of Honolulu is awesome. Outstanding meal, the Signature never disappoints. I had a wonderful Birthday! Good food, beautiful view. Our waiter, Keola, was excellent. The food was very well prepared and nicely seasoned. The delivery of food and beverages was well timed. Also enjoyed the live piano. We had wonderful service. The food was delicious, the service was great and the ambiance was lovely. Great food and service, I really enjoy the sound and the place, it’s our anniversary and they gave us a complimentary dessert with a candle. 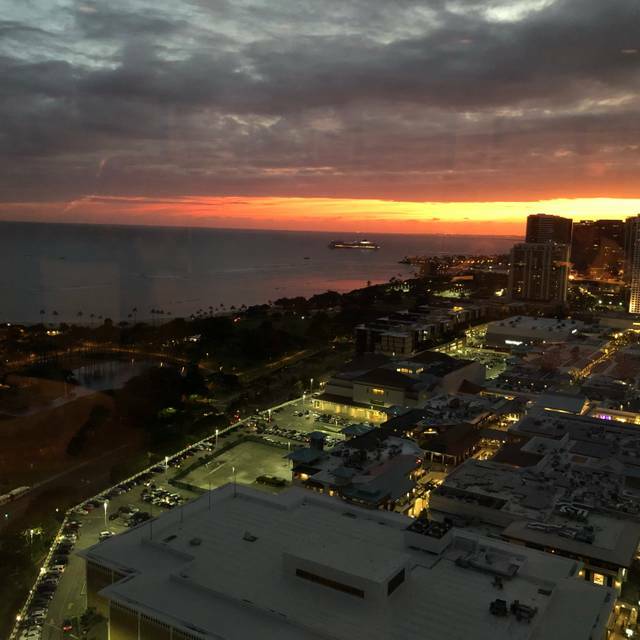 Great food, great service, great view! Wonderful experience! waiter forgot our oysters and served 2 salads instead. steak came out first and i was worried that i would get too full and i was so i didn’t mention the oyster. the check came out and oyster wasn’t included, but instead another salad we didn’t order. i was too full to ask for oysters and i enjoyed the steak so i came out without complaining much. Wagyu Tomahawk steak was delicious! And the oysters in a half shell. We also tried the lobster bisque and liked that as well. Beautiful view. Fantastic food. Great waiter & service. Only request to lower the music volume. Music always makes for a fun & upbeat atmosphere, however don't like when it becomes difficult to chat. Next time will ask to be seated at the other end of the restaurant if music less intense. We will go there. Love the foods and beautiful view. It is nice restaurant. Waiter Pono outstanding meeting special requests. A great experience. The food is great. The service is equally great. The staff made our anniversary one worthy of memory.